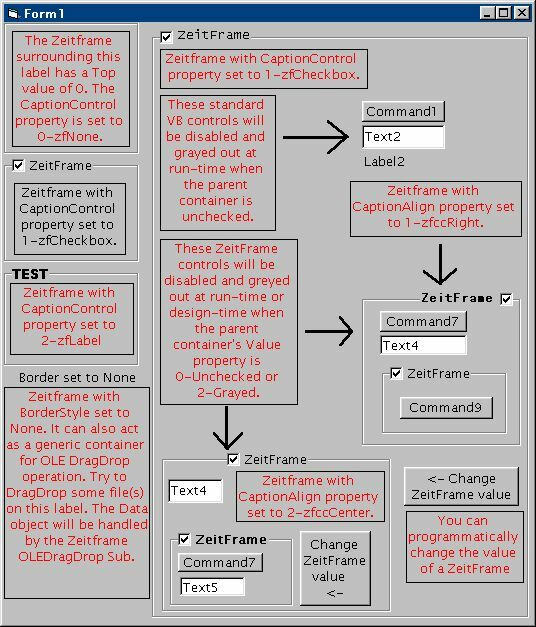 The zeitFrame ActiveX Control is a visual container ActiveX component. The zeitFrame control is like the regular Visual Basic frame control with an optional checkbox to enable/disable the container's controls. The zeitFrame ActiveX Control is free software distributed under the GNU GPL. 0 - zfNone: No caption. The frame act as a pure container. The Top property will correctly reflect the Top value of the frame. 1 - zfCheckbox: With checkbox. The frame's contained controls are enabled/disabled by the checkbox. 2 - zfLabel: With caption. Act as a regular Visual Basic frame control. Value: Value of the control's checkbox. 0 - vbUnchecked: Disable contained controls. 1 - vbChecked: Enable contained controls. 2 - vbGrayed: Disable contained controls. Also makes the caption and checkbox appear grayed out. CausesValidation: Include the Validate event. Enabled:	When False, the frame's contained controls will be disabled. Align and Negociate: Determine if and where the control is aligned. Negociate deals with toolbars. BackStyle: Transparent background or not. Might be useless right now. The zeit_frame.ocx will be registered and copied to your SYSTEM directory. A test program will also be copied to the directory of your choice. Run the zeitFrame ActiveX control Test program (ZeitFrameTest.exe) to see if the zeitFrame control has been properly installed. Run the ZeitFrameTest.exe file to test the control.